Last night, publisher Dar Merit sent out a notice that the second edition of Miral al-Tahawy’s “Arabic Booker” longlisted Brooklyn Heights will go to press in a few days. 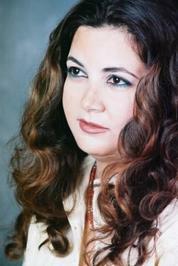 The publisher also said that new editions of her other novels: الخباء، نقرات الظباء، و الباذنجانة الزرقاء are also in the works. Besides Moroccan author Bensalem Himmich, Al-Tahawy is probably the most familiar to English-language readers. She is unusual in that—other than a 1995 collection of short stories—all her books have been translated into English. Her three previous novels have been translated as The Tent, Gazelle Tracks, and Blue Aubergine (all translated by Anthony Calderbank). Al-Tahawy was born in 1968 in the Egyptian Delta into a Bedouin family of the al-Hanadi tribe, the youngest of seven children. She earned her MA in Arabic language and literature from Cairo University in 1995, and has received critical acclaim for her stories both in Egypt and beyond. Once my short stories were published and I began receiving acclaim and complimentary reviews, then translators began visiting me. My mother looked at me as if I was someone important. She thinks I am abnormal, but she also thinks that it is possible to be talented. She wonders why I put her in my books. But that is not the only relationship that I put in my books. It is all my experience. It is a very hard relationship with my mother as she cannot make distance between her dream and me. She cannot understand this image about myself. She affects something… my self-confidence. This in turn affects my relationships. It takes time to discover myself and writing gives me that self-confidence to do so. You can find the whole longlist here. Just started Miral’s Brooklyn Heights. Looks like a keeper. Anyone out there who wants to fund my literary translation ambitions? I have three novels already lined up, all three by really good writers, 1 male, 2 female, 1 Egyptian, 2 Lebanese. Maia, if I come into any money, I’m the first one in line. There have got to be interested presses out there, even presses that don’t work with Arabic translations as part of their core mission? Of course you’ve already considered Archipelago, Open Letter, BQFP, Interlink/Clockroot, University of Texas…doesn’t Milkweed sometimes do translations, or at least international fiction? What about New Issues? U.K. publishers? Too bad about Aflame, of course…hmm…I will try to stretch my brain. SBAH DREAM .Please if u book Brooklyn Heights is availbel in arbic or not yet. I am in KUWAIT nowdays but going to CAIRO at least 3-4 times a year. Brooklyn Heights is available at any decent bookshop in Cairo. Please come get it! I don’t know about its availability in Kuwait….